In 2011 LOOS.FM designed a temporary pavilion in the public space for the Grenswerk Festival in Enschede, The Netherlands. The pavilion was to be a meetingpoint and a stage for performances and exhibitions. We searched for a recognizable building; the oddness of proportions only works if the image is recognized. The choice therefore fell on a church with a spire 20 meters tall. A church is a community building where people come together. It also serves an important role in organizing the public space: a church is always in the center of an area. In the same manner in which lighthouses guard a border and bridges connect people, a church centers an area. The pavilion (Abondantus Gigantus) is made up of so-called Legioblocks: concrete blocks that are very similar to the famous Lego bricks. The blocks are grey and nondescript, yet they possess an industrial beauty. Above all, the blocks are reminiscent of the toy-sized Legos while being the size of pyramid stones. Although these blocks are multifunctional, hardly anyone makes use of their full potential. They are mainly used in dumping grounds surrounding harbors, as a wall for iron scrap or for sheltering potatoes. Once a wall of Legioblocks has been placed, it usually remains there for years, even though they are easy and flexible to build with. The Legioblocks are easily stacked and versatile in their use. 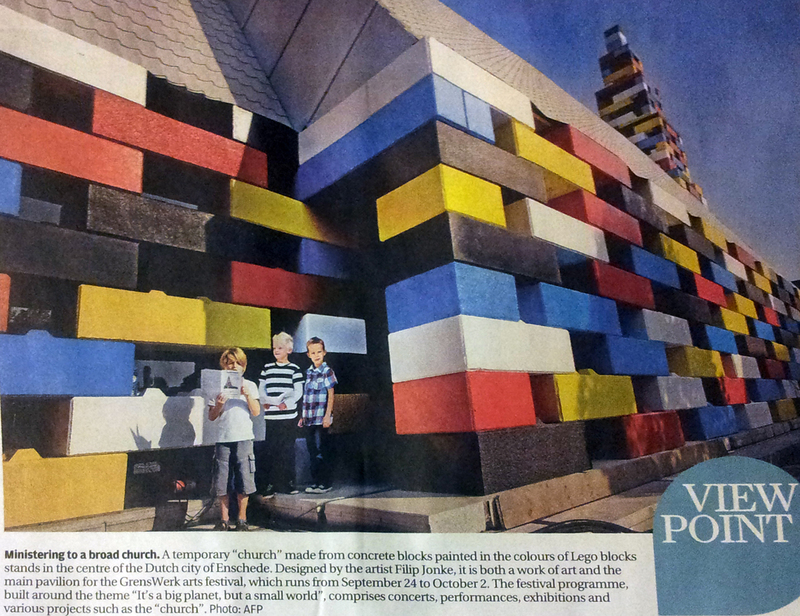 The concrete blocks are painted in 5 primary Lego colors and used indiscriminately to build the spire and walls. The blocks creates an oddness in proportions. 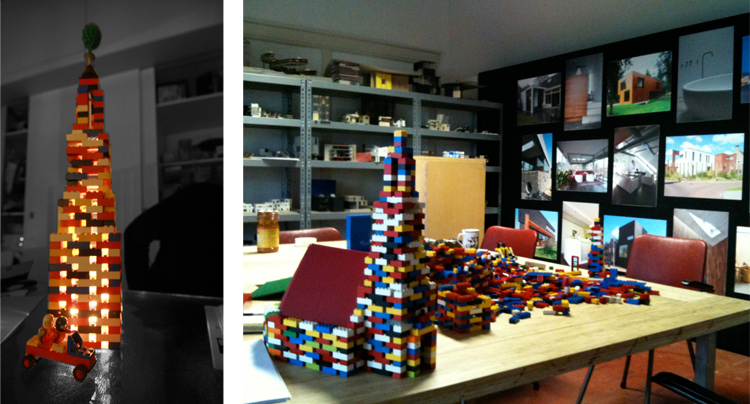 The reference to Lego bricks often call up feelings of remembrance, sentiment and creativity. The size of the church on the other hand, inspires the spectator with awe. The blocks are stacked in a so-called honeycomb brickwork. Because the blocks are not stacked firmly together, a (uniform) perforation in the volume occurs. This adds an extra dimension – day and sunlight entering during the day and at night emits an enchanting radiance; it´s a fascinating effect between volume and airiness. Because of this, the appearance of the object is continually changing. The reflection and absorption of daylight, sunlight and artificial lighting on the primary colored blocks provides another dimension to experiencing the spaciousness. The odd scale of the church invites the viewer to become aware of the things we take for granted and to observe them once again, more closely, and to either let go or accept. The church appeals to sentiments for a renewed sense of community. During the design process the definitive programming was decided. 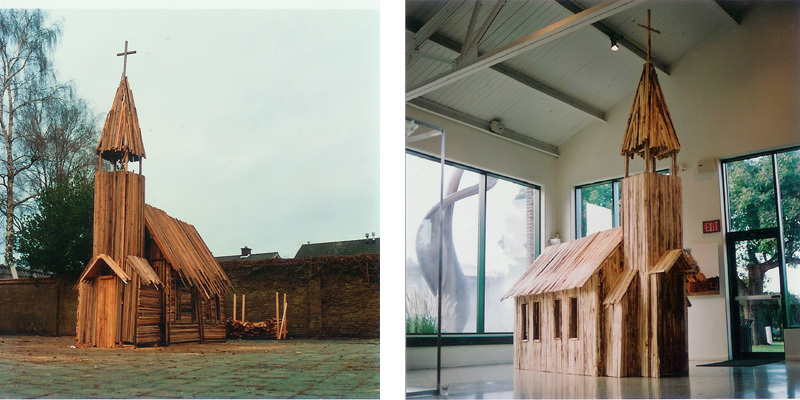 At this time, the final model of the pavilion was made. Three locations were created for a variety of activities. An inside and outside stage, a platform, and a room in the spire. A variety of activities were possible because of the open source programming in the Abondantus Gigantus. 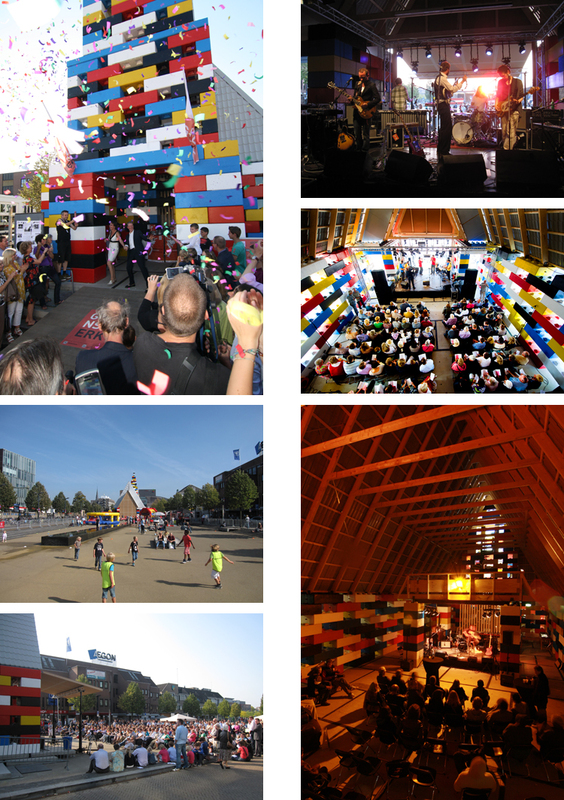 From a special sports day and a Lego building contest to opera and a church service. Anyone could make use of the church. With the choice in material we aim to show that with these blocks it is easy to build and vary. The material can be fully reused and the building is completely demountable. 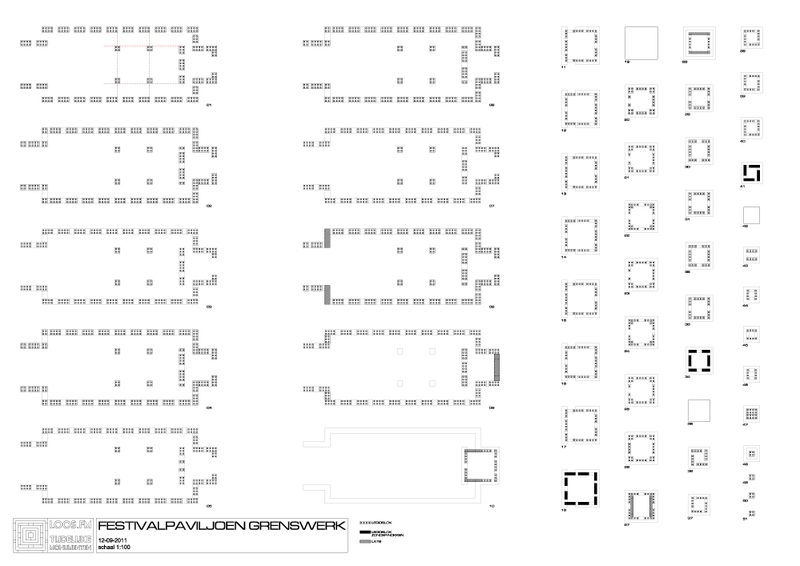 For each of the next editions of the festival (for a period of 5 years), the same blocks may be used to build a new pavilion. This makes the building less location-dependent. The pavilion makes a connection between something grand and overwhelming (the church and its size) and something playful, simple and comprehensible (Lego). Due to the Legioblocks´s increasing global popularity, this building may serve as an example for all that may be possible. During the design process the definitive programming was decided. At this time, the final model of the church was made. Three locations were created for a variety of activities [inside and outside stages, a platform, and a room in the spire]. n this former F16 hangar on Twente airport, a total of 618 blocks were painted. 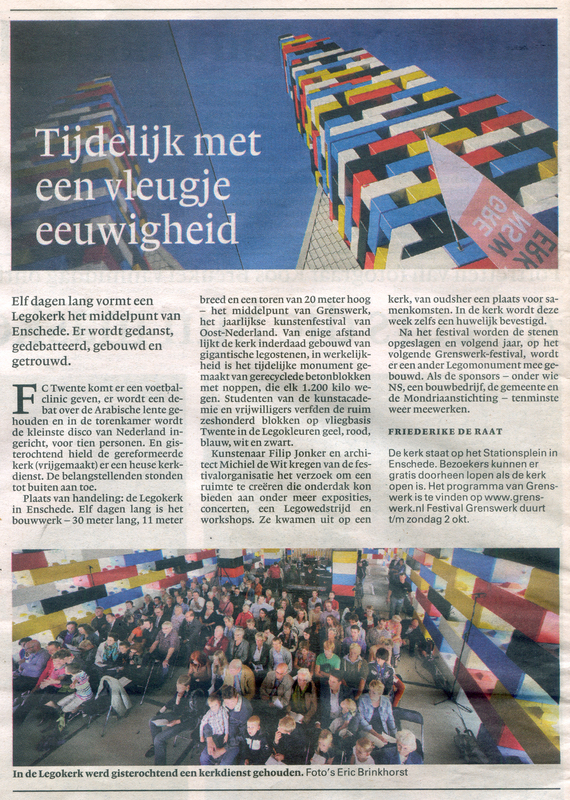 Thanks to many volunteers and dedicated construction companies, it was possible to build the lego church on Enschede’s station square in only two weeks. 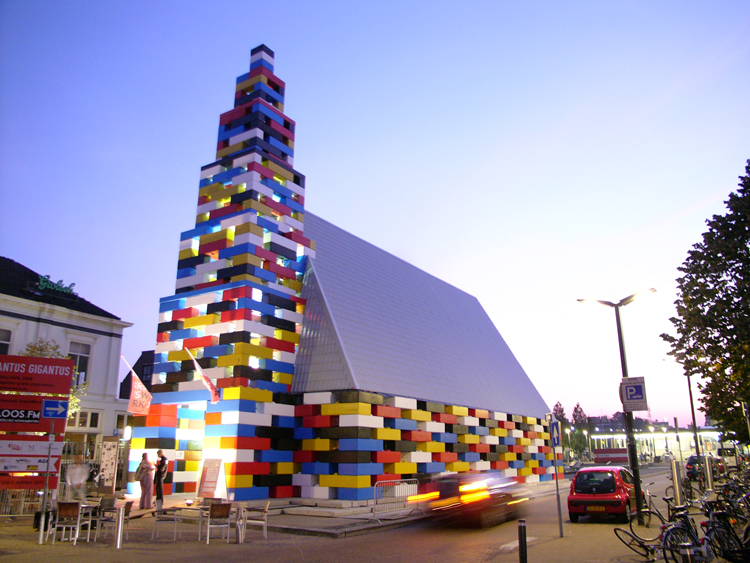 A variety of activities were possible because of the open source programming in the lego church. From a sports day and a Lego building contest to Opera and church service, anyone could make use of the church.